Your child’s high school education is the most important investment you will make. In high school students begin to reinforce and challenge the way they were taught to see the world. This means they will engage ideas of how to approach life. The faith background of their training, celebrating a Biblical or secular perspective, will generally guide the foundational truths that will build their thoughts, actions, and general habits that will guide them the rest of their lives. Hillcrest has 100 years of training students to live lives of eternal significance. We employ time-tested methods that form students’ ability to understand grammar, logic, and rhetoric. 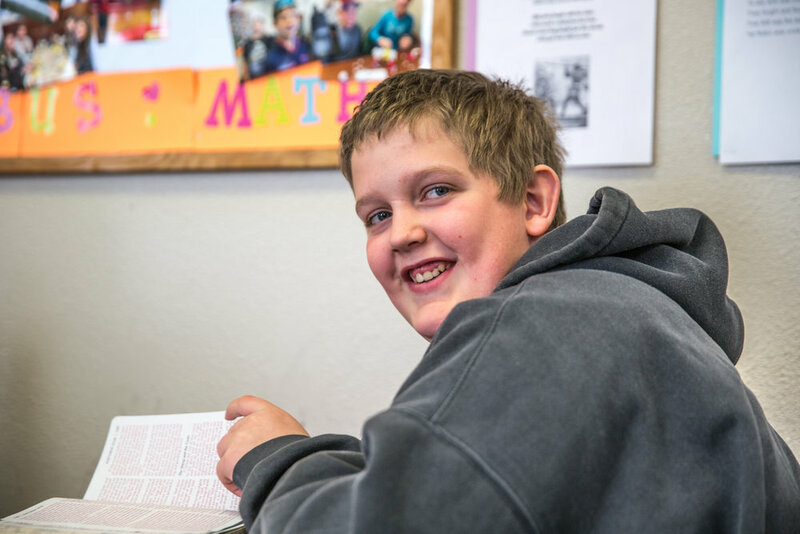 Many of Hillcrest’s classes rest on a Classical Christian model in training students to think. These methods produced the greatest thinkers, leaders, and scientists in the Western world, from the time of the Greeks until the late 19th century, including America’s founding fathers. In each course Hillcrest seeks to highlight interdependence in academic disciplines. It is common to hear Hillcrest students say their History class is like a Bible class, their Bible class is like an English course, and their English class is like a History class. Hillcrest integrates literature, history, language, art, mathematics, and science in a routine and seamless way in most classes. In these courses students build muscles of logic and wisdom to be expressed through well-crafted rhetoric. Education is most effective when it rises above simply conveying fact. Effective education cultivates thinking, driving students to articulate clear and persuasive arguments that hold foundation in God’s ordered design evident in the world. This means the greatest textbook studied is the Bible, because from it all other study finds form, function, and origin. In breaking the world down into individual subjects students are able to focus on various aspects of God’s divine creativity. Ideas have consequences! Good ideas have good consequences and bad ideas produce bad consequences. That may be obvious, but unfortunately, history is full of examples where that simple truth is violated over and over again to the harm and destruction of many. What we understand about God and the world affects what we believe about everything else, including the types of arguments we find persuasive and how we justify our actions. A pattern of ideas is called a worldview. It's the perspective one holds that shapes their beliefs, habits, and convictions that help make sense of God, the world, and their relationship to God and the world. It’s been said that people get their beliefs like they catch colds - by being around other people. In the 1950s a professor at Yale University named William McGuire developed a theory about how people come to embrace the ideas they find compelling. His insights can help us understand how we and others might come to adopt good ideas and oppose bad ones. McGuire theorized that ideas are very much like a virus, spreading from person to person. In our fallen and increasingly indiscriminate culture, bad ideas lamentably take root more easily than good ones. Thus, an effective leader must play a dangerous game: he must engage not only in building up good ideas but also rooting out the bad ones. How is it possible to do this without being incurably infected by the very ideas he hopes to stand opposed? Medical research has demonstrated that the human body could develop immunity to disease through the process of inoculation, introducing the body a weakened form of a virus to give the body’s natural defense mechanism time to build resistance to it. McGuire found that the same theory held true for resisting bad ideas. You can help support the annual fund of Hillcrest Academy by joining one of the giving clubs at the $120, $500, $1000 $2500, $5000 or $10000 level. Click here for a printable Club Giving sign up form. Click here for full Club Giving brochure. Why support Hillcrest Academy as a club member? Club members become partners in the ministry of Hillcrest Academy by helping to support the school's annual operational budget. As a result, they assist in keeping tuition rates low, making a Hillcrest education attainable for more students. Additionally, member support helps to secure Hillcrest's financial foundation into the future, ensuring that it will remain able to provide quality, Christian education for years to come. There is no limit to the term of your enrollment provided your continued desire to participate in the club each year. As personal circumstances change, club members may opt to move up to a new giving level. Be listed as a Club member in the HLA Annual Report and every issue of the Hillcrest Connection. Club memberships above the 120 level receive a Season Pass for home sporting events each year the club membership amount is received. A scholarship endowment to assist students has been established. Reunion classes have the opportunity to contribute to this endowment. This endowment will be supported by HLA alumni, with scholarships from this endowment to be awarded to certain students. Thank you to all alumni classes who will contribute to this very worthy cause. It was powerful to sit in Mrs. Foss’s class. I observed students engaging in politics, history, philosophy, culture, and faith while reading a classic book about courage and character! Consider the impact of your gift to a school that unites faith, learning and character formation in the classroom! The Hillcrest Fund subsidizes the full cost to educate each student at Hillcrest. It is our first priority in raising support for your school. Your generosity provides funding for ongoing operations. It helps to ensure excellent faculty and staff in the classroom and the dorms while helping to fund student support programs and scholarship aid. Our Hillcrest Fund goal is $425,000 this year. With your help we will reach our goal! To date we have received $290,000 in generous support. With four months to go, we have received almost 70% of our budgeted funding. Please take a moment to pray for the students and staff of Hillcrest Lutheran Academy! You are getting this letter because you love our school and know the value of a Christ-centered education! Will you also consider financially partnering with us to continue providing students with the incredible faith building, intellect developing, and character strengthening program at Hillcrest? INSIDE THE CASTLE | A LOOK AT CLASSICAL ED. “What differentiates courage from foolhardiness?” The question is deep, but highlights new approaches to character formation that are part of Hillcrest’s Classical Education program. The students shuffled in their chairs, some staring out the window where snow piled on the roof. The question was difficult to answer. Heads snapped back to attention as Mrs. Foss continued. “I want to compare King Richard the Lionheart with Cuthbert on a couple of things.” Eyebrows raised. G.A. Henty’s Winning His Spurs came to life in front of the students as Mrs. Foss animated the storyline. The differences between courage and foolhardiness seemed obvious from their reading, but silence still hung in the air as they pondered the question. After a few minutes of encouragement the students started recounting the details. Mrs. Foss’s class is dynamic. Students not only sift through character formation, but piece together knowledge from other classes to decipher meaning in the texts they’re exploring in Hillcrest’s new classical approach to educating students. “Who is controlling the land of Acre?” Mrs. Foss continued, addressing geography and philosophy in the first half of her class, now shifting seamlessly to social science. “The Muslims are fighting a Jihad, a holy war, and they are converting people by fighting them. They are moving all up in here.” Mrs. Foss’s hand moved up the map as students’ eyes tracked where Islam pushed before the Crusades broke out. “Many of these books--that are hundreds of years old--point to truth from the Bible. Like Beowulf that we just finished, he is like a picture of Christ and Grendel the monster is like Satan…Every day we have discussions about what we read and how it relates to current events, such as abortion and the evil monster that is behind it.” ~Hope Adams | Current 8th Grade student at HLA. The class period tarried on lessons from side stories in their reading. Tangible examples of how theology and philosophy drive history transitioned to deeper conversations. Character and virtue were dissected. Students leaned forward to consider defining courage with greater foundation. Bold actions supported by convictions may be brave, but students started to see how those same actions could be foolhardy. The virtue of courage formed legs from temperance and justice. “In closing I want you to open your Bibles to Proverbs 10.” Students pushed aside the red covered book for red lettered pages. “Thinking about courage, I want you to read this.” The passaged spoke to foolishness. Students compared that to the concept of courage they were forming in their reading lesson. They flipped to Proverbs 28:26, continuing their deep dive in character formation. “How do you get wisdom?” Students’ hands popped up. Their bold proclamations included patience, as well as learning from the mistakes and successes of others. Mrs. Foss pushed the students to think deeper. One student, quiet for much of the class, mentioned elders. Mrs. Foss agreed, calling out the wisdom of grandparents, before asking, “What about Scripture, and when you read something and you feel like you know something is right, how would you know it’s right?” Students said talking to people about the Bible in church, with their family, with pastors and youth pastors. “The class is sort of a combination of studying the culture, literature, and the Bible. It is cool how stuff that was written a long time ago still relates to how we feel today, about wars and good and evil.” ~Noah Synstelien | Current 8th grade student at HLA. Hayley said Hillcrest was her favorite place to be in the entire world. During her two years at Hillcrest she made countless friends and directed hundreds to Jesus through her testimony. Hayley passed away December 9, 2016 after a battle with cancer. Her classmates created a named endowment to remember Hayley, someone who loved Hillcrest, by providing an avenue for others to attend through financial scholarship. Hayley's classmates loved her. Hayley's personality and genuine love for Jesus made an impact that isn't forgotten. Hear what they had to say, and understand why they created this endowment in her memory. The videos above and below are two testimonies Hayley gave months before she passed away. Hear how close she was to Jesus, how her heart was molded by her relationship to Christ, and how her words compelled her brothers and sisters to greater faith in Jesus Christ. Hayley gave a perspective of her experience at Hillcrest to a group gathered to celebrate the community she made at the Castle. Listen to the impact the Hillcrest community made on Hayley as she interacted with friends, staff, and faculty as she grew in her relationship with God. Hayley continuously gave testimonies of the love of Jesus Christ. Hayley left a significant mark on her friends and classmates during her two years at Hillcrest. Consider joining those who knew her well to fund an endowment to make Hillcrest a reality for others. (Left to Right) Zeke, Diane, and Sam in their most recent Christmas card picture. Diane Ihrke passed away Wednesday, March 22, 2017. She worked many years in Hillcrest Academy's resident life program, functioning as a school nurse, women's dean, and women's resident life director. Days before her passing she was serving Hillcrest students fresh baked bread and having mentor conversations with the girls. She adopted two sons who are now Hillcrest students. Her sons are now living with close friends of Diane. This account will immediately support the tuition for Sam and Zeke, Diane's adopted sons, as they continue their education at Hillcrest Lutheran Academy. Diane Ihrke has had many roles at Hillcrest Academy. Her care was noted by many who received health advice when she was a school nurse. Her work in the dormitories saw many students transform bad habits, finding Scripture on Diane's tongue as she worked to correct behaviors so students more accurately represented the faith they professed. Most recently Diane worked with the dormitories in creating cooking nights where she taught students to make home cooked meals, replete with fresh baked bread, making Hillcrest feel like home. Diane with her cooking team at Hillcrest Dessert Night competition. Diane's team won. Diane loved community. She worked to build a place, both in her home and at Hillcrest Academy, that valued all people. She adopted two babies, now young men, and worked to establish a community of young men and women around her family. She was a trailblazer in the realm of courageous love in the community of Fergus Falls, known by all as someone who was concerned about how others felt, making sure there was a continuous community that supported those around her. Diane baking bread with dorm students for one of the many Dorm Bread Baking parties. Following Diane's passing, her two teenage sons transitioned to family friends who Diane desired to raise her sons should anything happen. In this tragedy, the boys are finding support from the Fergus Falls and Hillcrest community as they grieve and continue with their schooling. It is the desire of the boys to attend Hillcrest Academy, so the Hillcrest Board of Directors established a fund for people seeking to support Sam and Zeke during this time. Donations designated to the Diane Ihrke Memorial Fund are tax deductible, and will go to the immediate and future schooling expenses for Zeke while he attends Hillcrest Academy. Through the generous support of friends of Hillcrest, Sam graduated in 2018 with his tuition account paid in full. Nearly 100 people lined the hallways of Essentia Hospital in Fargo, North Dakota on Sunday, March 19th. Diane Ihrke experienced health complications during the night and was transported to an intensive care unit before Hillcrest families woke for church. After Sunday’s sermon, families and students ventured from Hillcrest to spend time with Diane’s family, notably her two teenage sons, Sam and Zeke. Over the proceeding 96 hours, friends from far and wide walked into Diane’s hospital room to hold her hand, sing praise songs, and say tear-filled goodbyes. With hymns playing in the background, drowning out the sound of breathing machines, Diane breathed her last breath in the company of friends and family on March 21, 2017. Diane was a Hillcrest cheerleader who never wore the uniform. During her days in Bible School she nursed football players back to health and mentored high school students to see that God has a sense of humor, and desperately cares for their needs. Later in life Diane adopted two boys, Sam and Zeke. From the time the boys were brought home they were surrounded by Hillcrest students. Diane would have the athletes over for bread and jam, watching Sam and Zeke play nerf basketball and wrestle with the Comets. She would eventually join the resident life staff, taking on the role of head dean. Her sons followed her to the dorms, instantly gaining siblings in Hillcrest students who spent cherished times with Sam and Zeke as Diane built a strong semblance of home in the dormitories. As the boys grew, Diane took other positions in the community, moving into a house that was often filled with Hillcrest students seeking fresh bread and jam. Diane would later find time to mentor Hillcrest girls, often hosting baking parties as she used food to break the ice and drive students to a deeper understanding of God’s love. Diane led Hillcrest’s baking club this past year, winning first prize with her team in the first annual Hillcrest dessert competition. She baked bread periodically for Sunday meals at the dorm, drawing boys and girls into the kitchen to laugh and learn as bread dough was kneaded, rolled, and baked around friendship. When Diane passed away Sam and Zeke transitioned to the home of Kate and Josh Haus. Kate worked in the dormitory with Diane in 2005. Kate and Josh have three kids of their own, all in grade school. Through some quick remodel projects while Sam was on choir tour, Kate and Josh have set up a bedroom for the boys in their home, working through the legal process to transfer their adoption. It is the desire of Sam and Zeke to graduate from Hillcrest, the school at which their mom continually worked to build a family-oriented community. In honoring of Sam and Zeke’s wishes, and knowing it was the desire of Diane for the boys to continue at Hillcrest, the Board of Directors at Hillcrest has established a special account to pay for Sam and Zeke’s tuition. Their 2017 school year has been paid in full thanks to generous donors. We invite you to consider supporting Sam and Zeke as they carry on their mother’s legacy, building community at Hillcrest Lutheran Academy. The Bread and Jam Dash is a fundraiser inspired by the memory of Diane Ihrke. Diane was a Hillcrest parent and supporter. Her sacrifices to enable her children to attend Hillcrest inspired her boys, Sam and Zeke, to want to raise funds for other families to attend Hillcrest. Diane found Hillcrest a place where transformation can take place for high school students. She created a warm and loving home where many students enjoyed fresh baked bread and strawberry freezer jam while receiving mentorship. After her passing in March her legacy continues. Sam and Zeke want to create a memorial endowment, using the Bread and Jam Dash to fund the account, for other students to experience the love and joy of being in community, something that continues at Hillcrest and something that Diane partnered with Hillcrest staff to create. Sam and Zeke are the children of Diane Ihrke. The two are very proud of the sacrifices their mother made to enable them to attend Hillcrest. In her memory, they are forming the endowment to enable more students to attend Hillcrest. Hear Sam's testimony below, given in a Chapel service at Hillcrest. In the late 1800s a group of Norwegian immigrants banded together to form a missional body of Christian fellowship. They later became known as the Church of the Lutheran Brethren. This group founded a Bible school a short time later in the early 1900s after a series of revivals caused parents and pastors to cry out for a place for further instruction for youth. The high school department grew out of the Bible school in 1916. While many Christian schools were later created in response to secular schooling, Hillcrest's founding has a unique passion in Biblically-based training with practical skills. What that means is the first mission of Hillcrest is to communicate the Gospel of Jesus Christ. From there, students learn and understand practical knowledge and academic skills as a reflection of God's design. A student recently told her teacher that she feels her Bible class is like a history class and her history class is like a Bible class. The Bible is infused into every academic and extra-curricular course at Hillcrest because our foundation is in training students to know the Scriptures. With this basis, Hillcrest has enhanced academic courses and college preparatory training from practical skills like typing, stenography, and business management in the 1930s and 40s to rigorous academic courses highlighting engineering, political science, introduction to the medical field, and apologetics. The school survived the depression era after teachers willingly worked for free and canceled salary debts the school owed them in a passionate move to train young people to know Jesus Christ and make His name known to the world, and the school continues through faithful testimony of the Lord calling teachers to decades of teaching and ministry in honoring the Lord. Because of this foundation Hillcrest has a storied history of asking the question, "Is this Biblical?" when faced with issues. The story of Hillcrest's first homecoming and the creation of their first yearbook lend perspective to this. The governing body of the school proceeded with caution in these questions, seeking first to understand if the desire for homecoming and a yearbook had their roots in worldy desires to reflect modern high schools, or if they were seen as an outgrowth of celebrating the good things God is doing at Hillcrest Academy. In setting foundations in Biblical reasoning, Hillcrest does have many contemporary traditions that high schools across the country have, but there is a strong Biblical base to all of them. The stories of homecoming carry unique celebrations to God's providence in the school. The reasoning behind a yearbook holds truths in highlighting the work of the Lord throughout the year. Canceling classes for days of prayer are also unique practices that carry a tradition dating back to the 1920s, but still have meaning and impact in students today. Hillcrest is embarking on another 100 years of ministry, and looking back at the founding of the school it is clear to see that the foundation is holding firm. God created this school as a place for high school students to take on their faith as their own, wrestling out hard questions as part of the natural maturity in a personal faith. God bless the ministry of Hillcrest Academy as it continues to equip students in a Christ-centered Bible-based environment of a life of Eternal Significance. We hope you enjoy this brief walk through the history of Hillcrest Academy. The Centennial Beacon is 28 stories coming from Hillcrest's history over the past 100 years. Historian and author Steve Hoffbeck has compiled some of the most poignant stories that have defined Hillcrest Academy. The Centennial beacon is a 10"X10" coffee table book. It presents vivid images from Hillcrest's Levang Gallery that give visual perspective to the stories that have shaped Hillcrest Academy. You will be able to view never before seen photos of Chinese missionaries who worked at and attended Hillcrest Academy and the Lutheran Brethren Bible School. There are also photos of the early days at Hillcrest, with students playing sports and in classroom settings that shows a storied past of Hillcrest that continues into the future. J.H. Levang was a cord that united the foundational roots of Hillcrest’s past with the trajectory Hillcrest continues to this day. He attended the seminary in 1938, where Hillcrest started to experience growth after the depression. During this era founders of the Lutheran Brethren Schools noted that the high school department was growing at rates unmatched by the Bible school and seminary departments. These leaders noted that the spiritual fervor remained the same even though the campus was growing younger each year. This experience enabled Levang to cast a vision for the school some thirty years later. 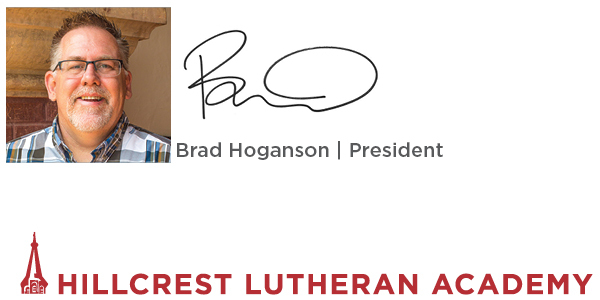 After various pastoring roles, Levang came back to Hillcrest in 1957 as the President of Lutheran Brethren Schools. Always a fan of music, Levang oversaw the creation of a brass band, and would watch the band grow into a full concert band. Levang also commissioned the creation of a full athletic program for the high school department, opening opportunities for Hillcrest Academy to play athletic contests with other schools. In addition to his vision to expand the character formation of high school students through extracurricular programs, Levang led initiatives to create a distinct seminary program through the building of a seminary building on campus. This was the first new school building the Lutheran Brethren constructed for their schools since the construction of the schools’ building in Wahpeton in 1904. Levang took great strides in hiring quality teachers in the mold of some of Hillcrest’s dedicated founding teachers like E.M. Broen, the Windahl family, and Marie Skovolt, hiring Don Brue to the English department and future Hillcrest Principal, William Colbeck, to the history department in 1958 and 1959 respectively. Levang continued to serve Lutheran Brethren Schools until his retirement in 1972. He would later serve 17 years as an archivist for the Church of the Lutheran Brethren. Family vacations often turned into historical exploration tours where Levang would drive hours off the beaten path to interview some of Lutheran Brethren Schools’ first students. His work produced a book titled The Church of the Lutheran Brethren 1900-1975. There was more talking than game planning before the games on December 28 and 29 inside the Comet gym. Players from Hillcrest’s 2000 second place in state team gathered with the 2001 third place team. Conversations didn’t center on Basketball or the old days. Discussions centered with how kids are doing and what is new in the workplace. Younger alumni shared how college is going, what campus ministries they’re involved in, and some of the challenging things that are happening on their campus. But when the laces tightened the focus shifted to a game the 30+ alumni who gathered knew by heart, instructed by Coach Preston to approach the court with special attention. As the chapel filled, classmates talked, some muttering of the war. It is warm, and the dry, dusty atmosphere created a soft, brownish light. In the midst of dark talk, one student begins to hum the hymn “It Is Well With My Soul”. A friend joins in, and then another. The students in the next pew look over and nod. They must have come from Mrs. Skovholt’s class, a class that gave students a grounding in uncertain times. President Brad shares an update on some of the new things going on at Hillcrest. The Centennial Beacon is 24 stories coming from Hillcrest's history over the past 100 years. Historian and author Steve Hoffbeck has compiled some of the most poignant stories that have defined Hillcrest Academy. The Centennial beacon is a 10"X10" coffee table book. It presents vivid images from Hillcrest's Levang Gallery that give visual perspective to the stories that have shaped Hillcrest Academy. You will be able to view never before seen photos of Chinese missionaries who worked at and attended Hillcrest Academy and the Lutheran Brethren Bible School. There are also photos of the early days at Hillcrest, students playing sports and in classroom settings that shows a stories past of Hillcrest that continues into the future. You may also use this form to submit address/contact info updates. We will not print updated addresses or phone numbers in the Hillcrest Connection unless you specifically request that we do so. If you are submitting an update on behalf of an alumnus, please enter their graduation year. If you have an image you would like to submit as well, please email it as an attachment to connection@ffhillcrest.org after completing this form. Thank you for submitting an update! Seniors are allowed 5 transcripts up to one year following graduation. All other requests will require a $3 fee per transcript. All accounts must be paid in full before transcripts are released. Please submit a separate form for each transcript request. Hillcrest staff will contact you to arrange payment if necessary. If you would prefer to print and mail your transcript request, the form may be downloaded here. Hillcrest may contact you to confirm the details of your request. Name of organization receiving transcript. I hereby authorize Hillcrest Lutheran Academy to release my transcript to the organization identified above. Hillcrest staff will contact you to arrange payment if necessary.